Hideaway Beach Club is unique among Marco Island real estate options. This gated community at the northwest corner of the island combines arguably the best part of the beach with a one-of-a-kind golf and country club atmosphere. Unlike most of Marco Island, there are no canal homes here. Single-family homes are either beachfront or inland. 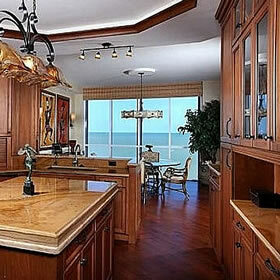 The beach condos here are luxurious and overlook the Beach and Isles of Capri. To top it all off, you have a beautiful executive golf course in the community. 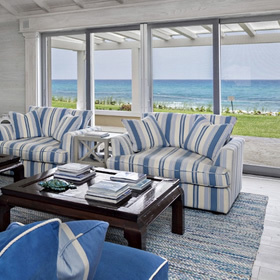 Hideaway Beach Club offers amazing inland homes and the only true beachfront homes on the island. The architecture is uniquely Hideaway. 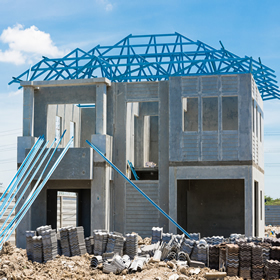 Browse all of the beautiful homes currently on the market. If you think of any questions, just give us a call. We're Hideaway Beach Club experts. The condos for sale in Hideaway Beach Club are known for their breathtaking views and spacious floor plans. The Royal Marco Point buildings including Riviera are beachfront and the elegant Habitat is intertwined with the golf course. See every Hideaway Beach condo here at BuyMarco.com. The are still some vacant building lots available in Hideaway Beach Club. Unlike most of Marco Island, these aren't waterfront lots. However, you can't get better beach access anywhere. Add to it the unique Hideaway Lifestyle and you really have something special. Riviera is the absolute pinnacle of luxury beachfront condos in Hideaway. You'll love watching the boats come and go all day from your large lanai. For that matter, the dolphin and pelican traffic is fun to watch, too. These condos live like private luxury homes. The pool area is awesome, too. 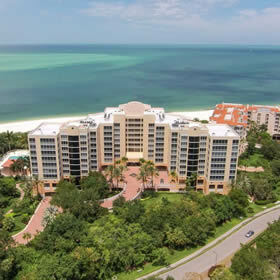 The three Royal Marco Point complexes occupy some of the most naturally beautiful real estate on Marco Island. The views are arguably the best around, and on this island, that's saying a lot. Call us for a tour of Royal Marco Point and Hideaway Beach and you'll be hooked. Guaranteed. 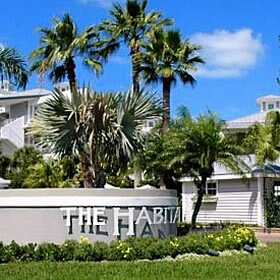 Habitat condos in Hideaway Beach Club are big, spacious condos that live like houses. Many of them are directly on the 9-hole golf course. These 52 condos really are like nothing else on Marco Island. Not on the beach, but minutes away by golf cart. Check them out. Hideaway Beach real estate is absolutely unique among homes on Marco Island. Immediately after passing the guarded gatehouse, visitors know they have entered a special community. The foliage is nothing like the rest of the island. While developing the bulk of Marco, it was necessary to level the natural flora to create the canals and building lots. Since Hideaway has no canals, this wasn't required here. The natural landscape flourishes. Next, the architecture here is different as well. It's interesting and eclectic while still epitomizing luxury. Tucked into mangroves and Plumerias, the homes seem more like tropical sanctuaries. 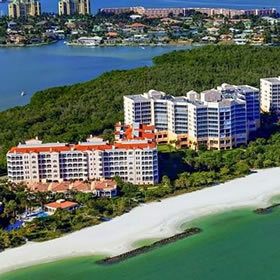 The condos at Hideaway Beach are some of the most popular luxury condos on Marco Island. The views at this end of the beach are really spectacular. There is lots of boat traffic as well as Dolphin traffic. The hours can get away lounging on breezy lanais overlooking Tigertail Beach and Isles of Capri. The golf course at Hideaway Beach Club is a 9-hole executive course that is a blast to play. It is a Par 32 course with a rating of 30.9 and a slope of94 from the championship tees. Yep, there are three sets of tees on this 1844 yard course that was renovated in 2005. There are no carts so you can get a little exercise strolling among the Palms and Gumbo Limbo trees. Whether you choose a house or a condo, the Hideaway lifestyle is included. Marco Island is captivating, but Hideaway takes the best of Marco and makes it even better. When you go through the gate for the first time, you'll see what we mean. You'll realize that you've found a new level of whatever it is that makes Marco Island the most special place on Earth. The first thing you'll notice is the foliage. There's nothing like it on the island. Large tropical trees overhand the idyllic streets. Flowers dot the shady nooks and crannies. The next thing you see will take your breath away. The beach and water views are impossible to describe adequately. There simply isn't a more picturesque view on the island. The beach here feels like a private Caribbean resort. The restaurant, pool and other amenities are located right on the beach. Because Hideaway Beach Club is a gated community, the beach area is always quiet and private. The amenities are flawless and there's always something fun to do. It's the most complete lifestyle package available in southwest Florida. We have golf, tennis, croquet, swimming, Bocce and even massage therapy. The fitness center is the most state-of-the-art and complete on the island. If you are looking to Marco Island because lifestyle is important to you, visit Hideaway Beach Club. This lovely gated community is situated directly on the Gulf of Mexico. With its more than 300 acres of property, half of which are wetlands and preserved conservation land, the Hideaway Beach Club offers private homes among the largest concentration of native Florida Live Oak trees. Its over 150 acres of land contain single family homes, private beach villas, condominiums, and even prime lots zoned for building. One of the many advantages of living here is the Hideaway Beach Sports Center. This premiere recreational facility offers over 6,000 square feet of usage which contains a modern fitness center, steam room, therapy room, garden room, expansive men’s and women’s locker rooms, and an over-sized shaded deck. There is also a Gulf front Beach Club which plays host to a wide array of entertainment and dining choices to satisfy any appetite or culinary tastes. The Center is fully staffed with a team of highly qualified professionals who are available to assist members with tennis, golf, fitness routines, croquet and more. Plus, there is a Pro Shop which has all the latest up to date accessories and recreational fashions. Living near the crown jewel of Florida that is Naples is delightful in and of itself. When the Hideaway Beach Club is your residence, it is even more so. The club's pool and two restaurants (casual & fine dining) are located directly on the beach. It is one of the most scenic spots in Florida. The fitness center is the best on the island, bar none. The nine-hole executive golf course is one of only two golf courses on Marco Island. Hideaway Beach Club is the only place on Marco Island that allows golf carts on the streets. Hideaway Beach Club is the only place on Marco Island where you can live in an actual beachfront house. Where is Hideaway Beach Club? Not finding what you want. Just drop us a note below and we'll make sure you see everything you want to see.